Crowdsourcing as Healthcare Policy: Can’t We Do Better? GoFundMe donations are a good Band-Aid for a bad system, but can’t we harness America’s generosity in service of better social programs? Crowdfunding is becoming more and more a fact of life in America. 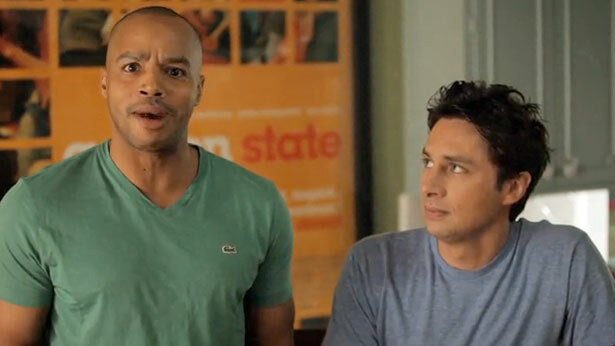 A Kickstarter for Zach Braff’s latest cinematic effort appeared this week, and it did not kick up quite the excitement that the Veronica Mars film did a little while ago. Braff, as a celebrity and/or creator, simply doesn’t command the kind of worshipful fandom the show did, nor the sense of injustice that a premature cancellation of a good show can bring. Yet, as of this writing, Braff has amassed $1.7 million for his Wish I Was Here. And counting. You don’t have to have any opinion at all on Braff’s oeuvre to raise an eyebrow at the priorities here. We live in a country where Social Security is about to go bankrupt and serious scientific and medical research has been kneecapped by the sequester. Yet every two-bit marquee name with a tenuous claim to artistry can simply wake up in the morning, create a new webpage and draw in this kind of cash. Sure, “donations” and “taxes” aren’t precise equivalents, and keeping Social Security afloat does not have the panache of Hollywood. Still: Is there no way to have some of that generosity creep into American attitudes towards social programs? This question becomes particularly hard to avoid in an era when crowdfunding efforts have diversified to include healthcare. I ran across one, recently, that aimed to get the retired actress Karen Black cancer treatment. Then, in the wake of the Marathon bombings of last week, I saw another that promised to cover the medical and rehabilitative expenses of a man, Jeff Bauman, who became famous last week because of a gory picture of his being wheeled away from the scene, minus his lower legs. (He was also the man who identified the bombers to authorities.) And The New York Times this morning informs me there are others, for Celeste and Sydney Corcoran, a mother and daughter pair who lost three legs altogether, and Christian Williams and Caroline Reinsch. I realize this sort of thing has a long tradition here. When I first came to America I used to express horror at the prevalence of the healthcare fundraiser, a phenomenon that is rather unknown in my native country. “Oh Michelle,” said a liberal friend dryly, “You’re being Canadian again. Where else, other than healthcare fundraisers, would this delightful sense of community come from?” A decade later, I’m more acclimated to it. I’m not interested in slagging on either the desperation of those who need the money, or the charitable impulses of donors themselves, who are just trying to make the best of a really bad situation. So please don’t get me wrong: if you can afford it, I encourage you to click on the links and donate. But this is still all a bit unsettling. The prevalence of these sites tracks an enormous, and often politically untapped, groundswell of generosity in America. GoFundMe, a popular choice for medical expenses, raised over $30 million last year. Crowdsourcing sites overall approached $2.8 billion. I realize that’s a drop in the bucket as far as Social Security or Medicare are concerned, and yet it isn’t so small a drop that it’s beyond discussion. If there’s some way to get people to dedicate that money to other, greater goods, it’s worth discussing. That is true not least because another of the metrics crowdsourcing quantifies is the way in which being injured in some particularly notorious way, or having a name people recognize, will get you money a lot faster. As I’ve argued before, it’s unfortunate, if not precisely tragic, that the proponents of crowdfunding models for cultural products understate the degree to which their success rests on a pre-existing brand. Social science on the results of crowdfunding efforts are limited, but they do suggest I’m right here. One recent study showed that Facebook friend numbers were positively correlated with successful ventures, as well as geographical location, though those were Kickstarter projects, whose appeal is somewhat less emotional than a “I need cancer treatment” one. Within that rubric, it’s worth asking about the fates of the many people with medical problems in this country who will never have such a widely publicized platform on which to ask for the cash. No doubt geography already plays a role in the quality of healthcare one receives (this is also true in my native Canada), but the possibility that “brand” or number of Facebook friends are having a literal effect on the allocation of medical treatment really starts to turn my stomach. I further have a suspicion that somewhere in the insurance boardrooms of America the availability of crowdfunding is being explored as a reason to deny claims or raise co-pay ratios. And that’s not to mention that if it’s demonstrably true that someone can raise, say, $50,000 on the Internet for a necessary MRI, $50,000 starts looking like a reasonable price for one. Ethos creep is a problem here. The solution is obvious to most leftists: move to a single-payer model of healthcare and a lot of the need to fundraise instantly evaporates, and along with it the ethical problem I’m describing. But absent Congress hopping on that this week, it’s worth asking if there’s some other way this financial voluntarism could be harnessed, politically, to get Congress to that place. After all, the unavoidable observation that comes out of reading appeals on these medical fundraising sites is the sheer desperation of a population without a meaningful social safety net. We all know the statistic that medical costs are the number-one cause of bankruptcy in the United States. We all know people who have had trouble getting support and appropriate resources. We also know that people are able and willing to make sure that their friends and neighbors do not starve in the face of calamities like these. The popularity of sites like GoFundMe, as I said, gives this a concrete and easily-referenceable form. The visibility it brings ought to get people thinking about how, other than the quick, individualized Band-Aid of the fundraiser, to solve this problem, right? It should be possible to use all these cries for help on the Internet as proof that things have to change at a large, system-wide level. Maybe that’s my Canadianness talking again. But it sure feels like a question worth asking. Why did basketballer-turned-tycoon Shaquille O’Neal box-office-out the new film on political prisoner Mumia Abu-Jahmal? Read Dave Zirin’s take.